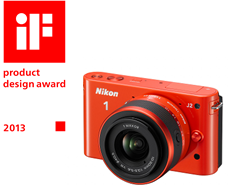 TOKYO - Nikon Corporation is pleased to announce that the Nikon D4 digital - SLR camera and the Nikon 1 system, which includes cameras, dedicated lenses, a dedicated Speedlight, a dedicated GPS unit, - have been awarded the "iF design award 2013: iF product design award. The iF design award is globally prestigious award sponsored by International Forum Design GmbH of Hanover Germany. The iF design award has been sponsored by International Forum Design GmbH of Hanover Germany since 1953. Each year, recipients of these prestigious awards are selected from worldwide industrial products exhibiting superior design. The awards include the product design award, communication design award and packaging award, etc. This year, 4,352 products from 51 countries were evaluated and the awards are presented to 1,410 products. In selecting recipients, product aspects including quality of design, functionality, degree of innovation, universal design and brand value+branding are considered for the product design award. The Nikon D4 is Nikon's latest flagship digital-SLR camera. It is equipped with a new Nikon FX-format CMOS image sensor (imaging size of 36.0 x 23.9 mm) and EXPEED 3, Nikon's latest image-processing engine. Together, these features enable superior image quality rich in detail along with excellent high-speed performance. The D4 responds to a number of demands from professional photographers working in the field with highly advanced functions and the ultimate in performance. Last year, Nikon released a new digital camera system that offers new forms of imaging expression. The cameras included in this system are described by Nikon as "Advanced Cameras with Interchangeable Lenses". 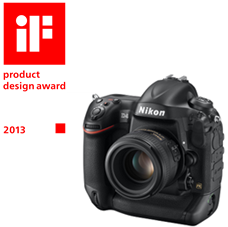 This entry was posted in Nikon 1, Nikon D4 and tagged iF Product Design Award. Bookmark the permalink. Trackbacks are closed, but you can post a comment.